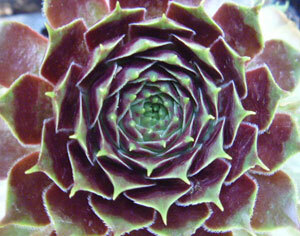 Sempervivum have been known for centuries as hens and chicks, and also called houseleeks in many areas in Europe. Ancient lore tells of using Sempervivum to repel evil spirits and protect homes from Thor, the god of thunder and lightning. The villagers of days gone by would plant Sempervivum on the roofs of their cottages as protection against fire caused by lightening strikes in the very first recorded instance of fire smart gardening. 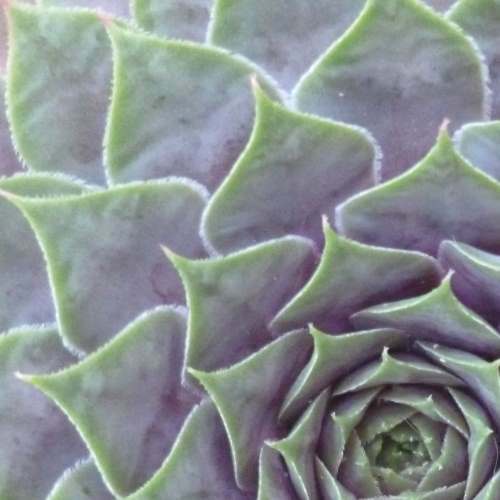 There are many species, and many selected varieties of those on this extensive Sempervivum list to choose from. No matter which kind you choose, you can't go wrong! There are no bad combinations of these great garden plants; See some of the varied colors, shapes, sizes and textures of the wide array of species in the picture. They all play well with others, and support many other xeric plants in an outstanding display of communal living and harmony. Nowadays, as well as growing them on green roofs, we use these great drought smart plants to beautify our xeric gardens, make living succulent wreaths or walls, and plant in containers for patio and dooryards or in succulent hanging baskets. They also happen to be perfect for using as wedding favors and flowers. There is a trick to preparing them so they look their best even after being shipped halfway across the country. See more about using Sempervivum for wedding flowers. Some of my favorite planters are those made from old weathered roots or satellite dishes, recycled into shallow bowls to plant in. I'm also in the process of building a Sempervivum wall to make an erosion prone bank into a spectacular focal point. Used as iron tough ground covers for perennial beds, accents in rock gardens, or grown in trough gardens, these indispensable and jewel-like plants are becoming popular again. Collectors can choose from huge specimens of Sempervivum tectorum that can reach over 20cm (8" - the size of a small dinner plate!) across, or tiny spider web types called Sempervivum arachnoideum species with rosettes only one centimeter (less than quarter of an inch) in diameter. 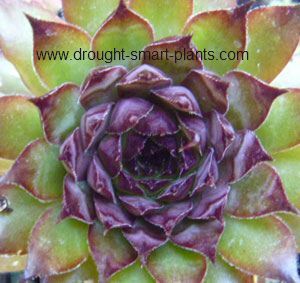 Sempervivum love dry soil and bright sun, so choose a place that gets at least four to six hours of full sun exposure. The soil should be well drained, preferably sandy and with some small rocks or pebbles for added drainage. Add some steer manure before planting and mix it in, or sprinkle on worm castings once a year for the perfect amount of nutrition. Mulch with lava rock, sharp gravel or pebbles to provide the perfect drainage around the roots. As the cooler fall weather approaches, enjoy the colour changes that occur in your collection of Sempervivum, and stop watering. The best way to kill Sempervivum is to allow them to go into winter with wet soil. They can be shipped bareroot in the mail, so they can withstand a lot of dry conditions, in fact, the drier they are (almost to the point of shriveling to nothing) the better they grow on when they arrive at their destination. When you open your box of Sempervivum from the mail order supplier, you might be shocked at how they're shipped - they may look like no plants you've ever seen before - they may be shriveled and dormant, and have no soil and in some cases, no roots either! Not to worry, this is perfectly fine, and they will start to grow as soon as you plant them in the garden, in crafts or in containers. They may take a week or two to adapt to life in the light again, but these are tough plants. They have to be shipped in a forced dormancy to prevent etiolation, or stretching during shipping, and also to prevent mold or rotting from setting in. They can be dried out considerably, which also has the added benefit of cheaper shipping costs. Reputable mail order nurseries will ship Sempervivum and many other hardy succulents this way, but if you've never seen what the plants look like after this method, it can be surprising at how well they bounce back. Plant the rosettes as they are into dry potting soil, or in the garden. They don't require immediate watering like some plants. Water them as you get around to it, or simply leave them for nature to do it. In extreme drought, I recommend that you irrigate a few times, or pot the plants into plug trays, pots or containers where it's easier to take care of them, and then plant in the garden in the fall. If you routinely get the odd rain shower, or reliable fall rains, this is the way to go. For planting in succulent crafts like spheres, mosaics and topiaries, they can be pinned in place, or stuff the roots or stolon into a hole in the coir fiber or moss. If they won't stay in place, a small piece of wire or bamboo stick will hold them until they root, after which you can take the pin out. The colours of Sempervivum can range from soft beige with dark brown tips, to dusky blue, to bright red, changing with the season. Many take on darker hues as cool weather arrives in the fall, to change back to green as they become dormant for the winter. They glow in the sunlight, showing amazing 'watermarks' or delicate stripes. The arachnoideum species, or cobwebs have gossamer webbing that in some cases almost totally encases the rosette. The choice of Sempervivum is amazing, with more new and unusual types being developed all the time as they hybridize with ease. I now have over a hundred and fifty named varieties and more types grown in the landscape in tapestry beds along with Sedum. I grow them from seed, and I marvel at the myriad forms, colours and textures of them - all different. 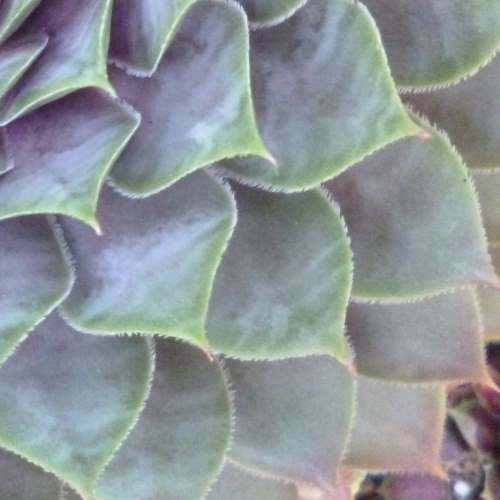 The rosettes are formed in a spiral pattern, with each new set of leaves making a smaller circle in the center of the plant. Once the rosette gets big enough, baby chicks form at the base and emerge on stolons to root into the surrounding soil. The stolons eventually become brittle and rot away, leaving a clutch of 'chicks' around the 'hen'. Eventually, sometimes in year two or three, the hen will bloom, after which it dies, leaving a gap to be filled in with the chicks as they grow. A sizable cluster of rosettes will result as each successive generation spreads wider afield in a textural carpet. 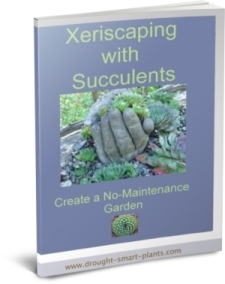 Having problems with your Sempervivum? See more about that here. Combining many different types and sizes of Sempervivum with other hardy succulents gives the look of an ever changing patchwork quilt. Group them in clusters and allow them to combine to show off the textures and colours as a ground cover, or planted among rocks. In time, they'll fill in a pot or container to spill over the edge, sometimes dropping off and rooting into the ground below. Easy to grow, easy to move, just pull gently until the rosette tears away and plug it into the next empty spot in your xeric garden. They don't even need to have roots on - just insert the stolon where you want the chick to grow to hold it in place until the roots emerge. 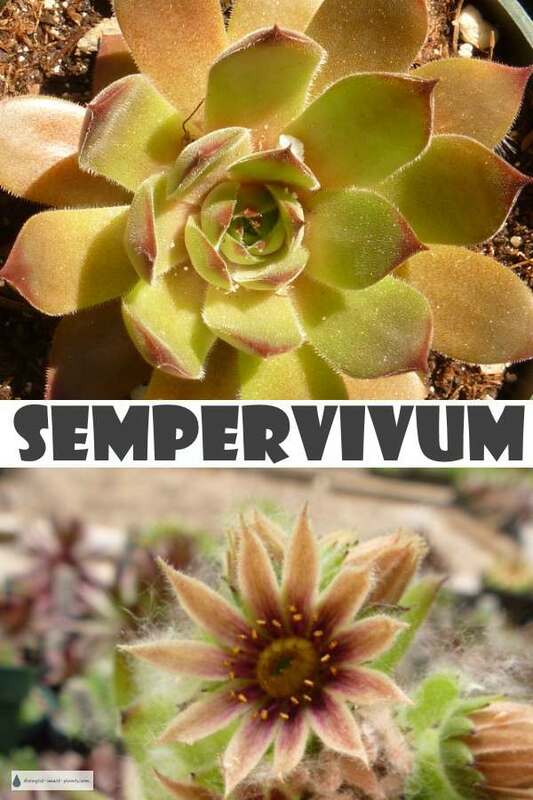 The rare and unusual Jovibarba are similar in appearance and culture to Sempervivum, but have some different and unique characteristics. Leaves are slightly fuzzy and relatively thin. Green throughout. Found in Pennsylvania. I think it is a succulent, but I have no idea what kind. Succulent is kind of "webby"
Need help identifying a 2x2 succulent! Help me identify this succulent. 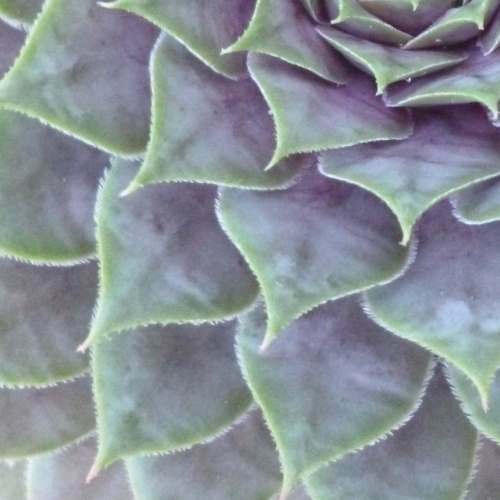 Looks like a Sempervivum but the leaves point downward? 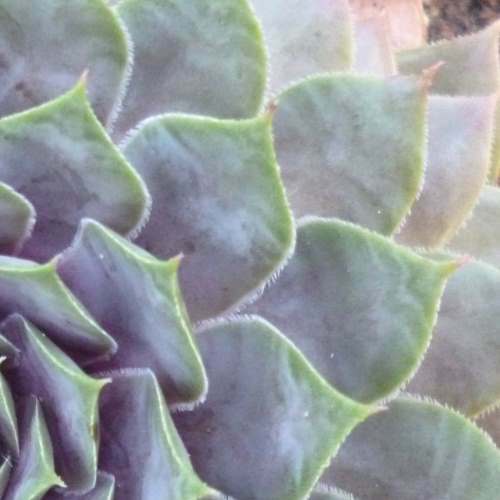 Is this "Assorted Succulent" an aeonium? I don't know what kind this is? Please Please help me identify my Sempervivums, Thank you!